It's World Hosting Days in Germany this week, a conference that bills itself as the biggest trade show devote to hosting and Internet service providing, and x86 chip maker AMD is using the opening day of the event to showcase its "Zurich" Opteron 3200 series processor aimed at single-socket servers. 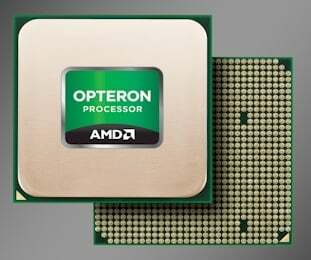 Last fall, in the wake of the announcement of the 16-core "Interlagos" Opteron 6200s processors, for two-socket and four-socket machines, and the 8-core "Valencia" Opteron 4200 processors, for single-socket and two-socket machines, AMD took out a pencil and wrote the Opteron 3200s on its roadmaps for delivery this year. The goal with the Opteron 3000 was to get a single-socket server machine that was less expensive than what you could do with the Opteron 4000s, but still having all these server goodies. The Opteron 3000 series, AMD said, would plug into the AM3+ processor socket used with workstations and some entry servers rather than the more expansive C32 socket used with the Opteron 4200s. This would enable AMD to get a processor, its socket, and chipset down to a lower price point than was possible with the Opteron 4200s. It would therefore allow AMD to better compete against single-socket microservers based on rival Intel's Xeon E3-1200 and other exotic chips like those from Tilera and Calxeda. Equally importantly, unlike desktop AMD FX processors that some hosting companies try to use in PCs converted to be servers, the Opteron 3000 series would have the full server validation and test flow of the Opteron lineup. It would also include ECC scrubbing on main memory and other reliability and manageability features that the Opteron chips have and that FX chips don't. The lifecycle on the Opteron parts is also longer than for the FX desktop parts (it varies depending on the model and what is going on in the economy at the time), and the Opteron 3000s would sport proper server-style chipsets with more I/O and slots than your typical PC has. Finally, the Opteron 3000s would be certified to run the actual server versions of Windows, Linux, and Solaris – not just leave you hoping these would work. And, these chips, being used in mega-datacenters, have to run cooler and on a 24x7 basis for years. 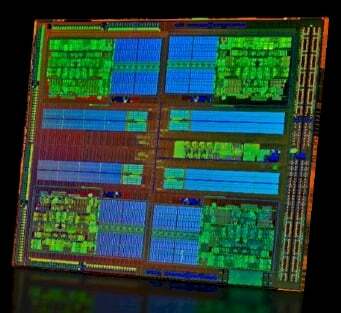 So AMD got out its CAD tools and snipped down the Opteron 3200 chip specifically to meet all of these engineering requirements. There are three Opteron 3200s, two with four cores and one with eight cores. The single memory controller on the die supports unregistered DDR3 memory sticks running at 1.33GHz, 1.6GHz, and 1.86GHz speeds on two memory channels that hang off the AM3+ socket. The DDR3 memory supported runs at 1.5 volts and has two ranks per DIMM; you can hang two sticks off each channel for a maximum of four memory sticks, with a maximum capacity of 32GB. If you want to run memory at 1.86GHz, you can only put one stick on each channel. The Opteron 3200 server platform makes use of AMD's SR56X0 and SP5100 family of chipsets, which can sport up to 42 PCI-Express 2.0 lanes of I/O traffic. 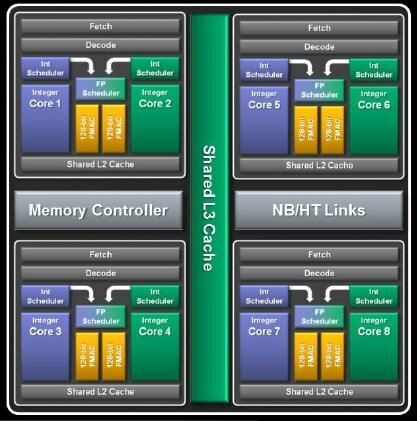 The chip has a single HyperTransport 3.0 link running at 5.2GT/sec coming off the die that links out to the rest of the system. The platform supports six SATA-2 ports running at 3Gb/sec, and the chip and chipset support AMD-V virtualization, IOMMU virtual memory, and APML remote power management. The base Opteron 3250 is aimed specifically at the budget hosting provider that is looking for the cheapest possible server, Michael Detwiler, product marketing manager at AMD, tells El Reg. This chip runs at 2.5GHz and has a Turbo Core with all cores on of 2.8GHz and 3.5GHz with only one core on. At $99, AMD reckons that its OEM partners could get a server node in the field based on the Opteron 3250 for somewhere around $573. That compares favorably to a single-socket server based on a Xeon E3-1200L processor, which would cost $643. These machines were built using MSI motherboards, a 1TB disk, and 8GB of memory from Crucial. That may not sound like a lot, but if you are charging somewhere around $90 a month for hosting, it means that your server pays for itself a month earlier with the Opteron 3200 than with the Xeon E3-1200. On the razor-thin margins of a service provider, this means something. So does the fact that the Opteron 3200s have four or eight cores – twice as many as the Xeon E3s – and in a SKU-for-SKU comparison offer up to 60 per cent better performance at the system level. So you can argue that your hosting offers more oomph than a competitor's using Xeon E3s for the same money. It seems unlikely that hosting companies will be able to charge a premium for extra performance. 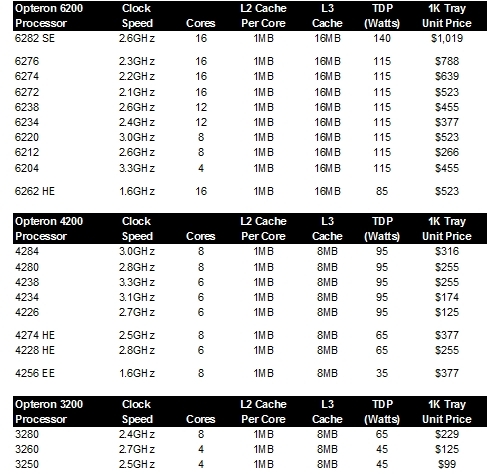 But maybe they can, and if so, there is an Opteron 3260 that offers around 6.7 per cent more oomph (as gauged by SPECint_rate_2006 benchmarks) but which costs 26.3 per cent more at $125 a pop when bought in 1,000-unit trays.